Debbie, Ray and their staff welcome you to the Westminster Tea Rooms Southport. The Westminster Tea Rooms Southport is situated on the most prestigious street that is Lord Street. We are a small independently run tearooms run by ourselves Debbie and Ray, and our wonderful attentive staff. You will be greeted by our courteous and pleasant waitress/waiter who is committed to providing you with excellent service, whilst our chefs are awaiting your order to provide you with our real home cooked traditional English fayre which has been lovingly prepared using only the finest of ingredients. Whether you are having a drink, breakfast, brunch or homemade cake, you can sit and relax whilst listening to the soothing music and soak up the quintessential ambiance of days gone by. We do our very best to cater for any dietary requirements:- gluten free, vegetarian, vegan are already on the menu, but please contact us in advance if you have a specific request. 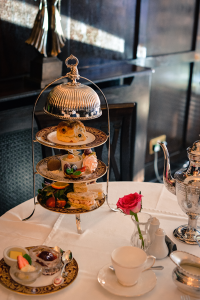 Our customers are our number one priority and we strive to provide the very best they deserve, and we look forward to welcoming you to our traditional, elegant and relaxing Tea Rooms Southport. Sorry we do not take any bookings at all & due to Customer requests, we do not allow pet dogs.